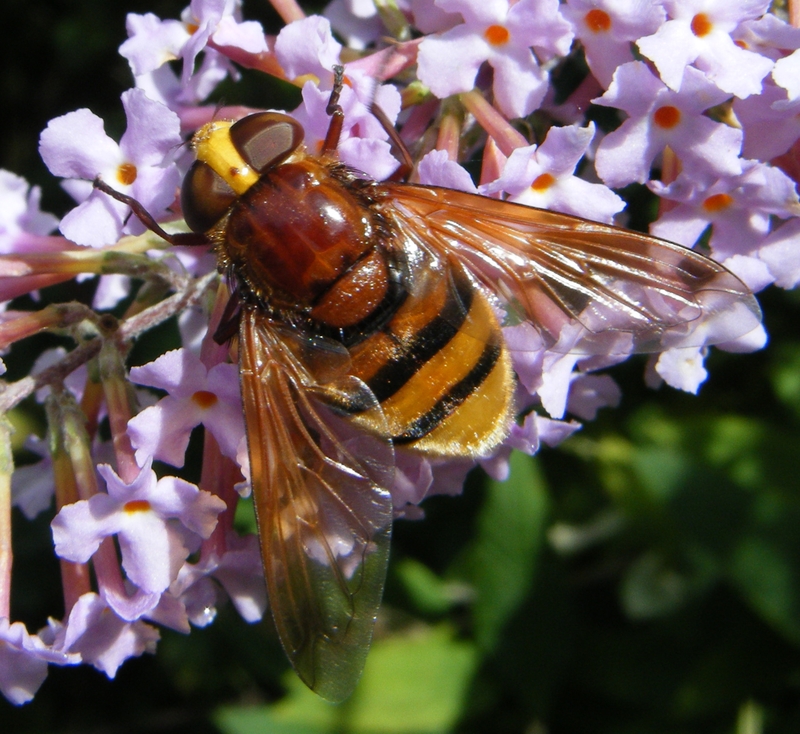 There is no need to be alarmed the Hornet Hoverfly (Volucella zonaria) is a harmless species. Although I will admit, in its outwards appearance, if you have never seen one before or happen to see it out of the corner of your eye, it is an excellent hornet Batesian mimic and will get your attention rapidly! The species mimics the colours and the size of the defended hornet, with its potent sting, to avoid predation. This species is off interest as for one its large and easily spotted (our largest species of hoverfly) and two it has only colonised the UK since 1940 and has an interesting biology. This species was seen on campus on the 20/August/2012, no doubt obtaining salts from freshly dug compost. Interestingly since approximately the 9/August/2012 entomologists have been wondering whether there has been a migration of the species from the continent as it has been seen further north in high numbers like never before otherwise the UK population has had an excellent year. However a large migration is most likely as a result of the bias mainly females have been seen, the great numbers and the fact that the species is known to migrate long distances and that with many UK species wasps have had a poor summer this year. As can be assumed from the name the Hornet Hoverfly (Volucella zonaria) is a dipteran, the order containing flies, most easily recognised by their single pair of wings and pair of halteres behind see image 1. The European Hornet (Vespa crabro) which this hoverfly species most closely mimics is a Hymenopteran, the order containing bees and wasps they have two pairs of wings and usually strong, visible biting mandibles. Two clear brown-black stripes on the abdomen of V. zonaria compared with multiple brown stripes, areas or dots on each segment of the V. crabro. The eyes are very larger in V. zonaria and touch at the top of the head in males whereas, the hornets eyes are smaller and never touch. Males and Female V. zonaria look superficially expect that in males their large eyes touch at the top of the head see image 3. V. zonaria has an interesting life-cycle. The larvae develop within the sociable wasp nests of Vespula vulgaris most commonly feeding on it is presumed the detritus within the nest and possible the larvae and pupae themselves. They no doubt feed in the nest late into the year and then pupate, as they emerge in early June-September. As a result of this long flight season, it is likely that there are at least 2 generations a year. It is also an “urban legend” across many articles that this species also feeds within V. crabro nests as morris (2004) states this is not true as there are no such recorded rearing records. Adults when they emerge from the nest it is presumed at night (no doubt due to safety of the intruded) they go onto mate and feed on the nectar of various common flowers such as Buddleia davidii. The spread of V. zonaria is interesting it firstly colonised the South Coast around 1940 especially reported from Folkestone, Bournemouth and Bristol before rapidly colonising South London by 1945-46. this suggests the species enjoys the Urban Heat Island Effect of towns and cities where the temperature is raised compared to surrounding countryside. From these point the species has been gradually colonising other areas of South England. There is no doubt that these colonisation events are helped by migrant reinforcement from the continent as is the case this year and it was found to thrive in the hot summer of 1976-77 in the UK which would explain the present eruptive migration from Europe which has in recent weeks has near 40 degree C heat wave. As a result of its gradual colonisation /migrations it has only been found in Berkshire and Reading over the last decade. If there is a breeding population here (to confirm breeding larvae must be reared from a nest) it is likely it has come from the London population. Berkshire until this year (2012), was very much on the Northern border of the population. As a result of its visibility it is very much a citizenship science project study creature as it is easily recognisable this is why bug life is surveying for the species so please sent any records whether in reading or the rest of the UK to Buglifes survey. 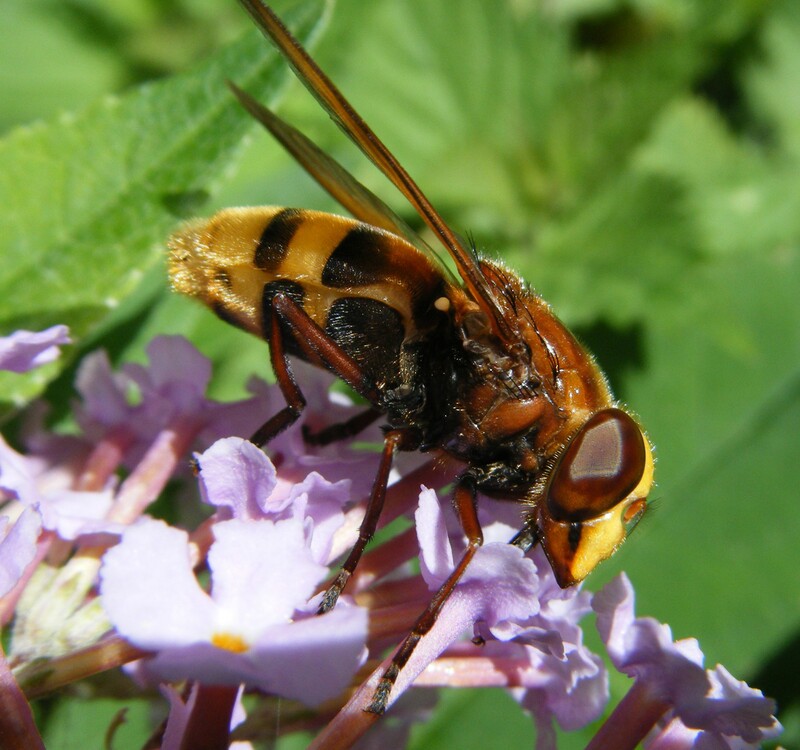 This entry was posted in Insects and tagged Diptera, European hornet, fly, hornet hoverfly, reading university, Vespa crabro, Volucella zonaria. Bookmark the permalink.